Cymbals can bring a lot of color to your drum set. There are a wide variety of cymbals on the market, and it is important to know what each cymbal brings to your set before you decide which to buy. After you decide on what your needs as a drummer are, then you can choose the appropriate cymbal to add to your kit. Here are a few tips on the different types of cymbals, and what you need to look for when you are out shopping. I have been playing the drums for over thirty years, and one of my favorite things to do is shop for cymbals. Cymbals are a vital part of your drum set, so they need as much consideration as they actual drums. Cymbals can give your kit a lot of character, and it can be fun to play with all the sounds and tones of a good set. A bigger crash cymbal for a big, dark sound, great when you play it alongside other cymbals creates harmony and melody all at once. An incredibly durable cymbal with its solid construction. 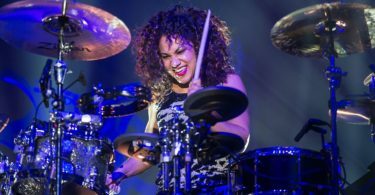 No matter what your style of music is, there are cymbals out there that will complement your playing, and that can even help you develop new techniques. One of the most commonly seen cymbals are hi-hats. You will see them with most drum sets and with pretty much every musical style. The hi-hats create the smallest subdivision of the beat. You will find that pretty much all drummers have one pair of hi-hats for their kit. 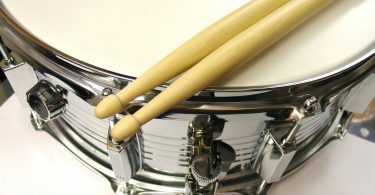 Hi-hats are sold in matching pairs, and they are usually sold in the 14 inch size for both top and bottom, but they can measure between 10 and 15 inches. Most of the time, the bottom cymbal is heavier than the top cymbal. They are mounted on a stand that stacks the top cymbal over the bottom one. 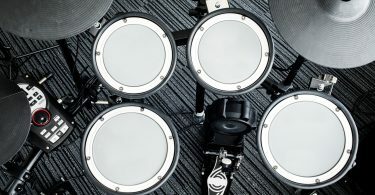 There is a pedal at the bottom of the stand that lets you play them by foot, although you are still able to play them with sticks, and they can be played in either the closed or open positions. One of the larger cymbals you will have is the ride cymbal that normally provides a ping sound. There are also other color choices for ostinatos or smaller subdivisions. Jazz drummers will always have a ride cymbal in their set, and most musical styles will use one as well. The ride cymbal is also one of the heaviest cymbals and the largest. They normally measure somewhere from 18 to 22 inches or from 17 to 24 inches. Most types of drummers will also have a ride cymbal with their kit. Accents are made with crash cymbals, and they create a crash sound that helps to create a musical transition. A beginning drummer will usually have one crash cymbal, but professionals will more likely have two or more. Crash cymbals are available in different sizes, and drummers will likely have a couple of different sizes for their kits in varying colors and sounds. Usually, a crash cymbal will measure from between 14 and 22 inches, but they are most commonly seen between 16 and 18 inches. A Chinese or “China” cymbal is used to create sharp accents in metal and rock music. They have a distinct sound and shape that is reminiscent of a gong, but they have a stronger decay. They come in sizes similar to crash cymbals, and they look like they are mounted upside with the bell pointed down. These are normally the smallest cymbal in your kit, and they create short accents and a splashy sound, hence the name. Typically, they come in 6 to 12-inch diameters, and they are used for all music styles. There are also very flat cymbals called “flat top rides”, and they are used in jazz music for their distinct sound. They do not have a bell, and their sizes are similar to ride cymbals. Sizzle cymbals sound like their name. Sizzle ride cymbals are most often used for jazz music, and sizzle crash cymbals are used as effect cymbals in heavier music like rock. A buzz sound can be created in a sizzle cymbal by drilling holes in them. Small metal rivets can also be added into the holes to create buzz. Center Hole – This is a part of all cymbals, and it is used to mount the cymbal. Bell – This is the raised part of the cymbal around the center hole. Bow – This is the area from the edge of the cymbal to the bell, and it is normally the largest area of the cymbal. Edge – This is the area of the cymbal at the end of the bow. 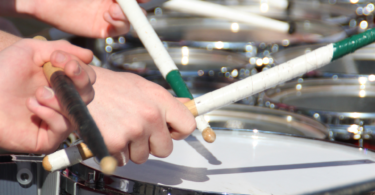 Finish – The finish is actually pretty important to the sound of the cymbal. There are all different types of finishes, and the brilliant finish makes them sound brighter. Cast– Molten metal is poured into a mold to create cast cymbals. Once the metal has set, it will cool into a cymbal shape. It will then be either lathered or hammered. These cymbals are very affordable, and they sound awesome. Hand-Hammered – These cymbals are some of the best sounding cymbals, and they are some of the most expensive. They are made from a solid metal piece that is hammered by hand into its final form. How this is done is a closely held secret by the top cymbal makers. Sheet – Sheet cymbals are made from a big piece of metal, and they are very much like cast cymbals. These are inexpensive cymbals usually used by beginners as they aren’t very durable, are usually pretty thin, and they are thought of as a waste of money by professionals. Every cymbal sounds different, so it can be hard to find a specific sound. This is even the case for cymbals that come from the same company. You need to spend some time just listening to the different tones in cymbals, like the difference in sound from a cast cymbal to a hand-hammered cymbal. 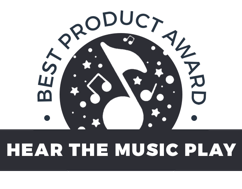 You can also find recordings of cymbals on some manufacturer’s websites. It is normal for a cymbal to become dented or break if used incorrectly since it is just a piece of metal you are hitting with a stick. Thick cymbals tend to be more durable, but the quality of the cymbal is another factor to consider. The most durable cymbals are usually the hand-hammered followed by the cast cymbals. Beginners tend to be the only ones that use the sheet cymbals since they tend to be on a budget. You will soon become familiar with the larger cymbal makers like Sabian and Zildjian as well as Paiste and Meinl who make higher-quality cymbals. Cymbals may seem expensive, but they are definitely worth the money if they are a high-quality product. Some of them increase in value, so you can think of them as an investment. Also, think about all the money you will waste on replacing cheap cymbals that can’t stand up to your playing, that’s just throwing money away. Beginners often get starter cymbals that sound awful, and they usually end up moving on to quality cymbals pretty quickly. So, if you are just starting out, it is worth spending that money on quality cymbals that you would otherwise be throwing away on starter cymbals that you will want to throw away soon. A good starter set up is a good pair of 14-inch hi-hats and a 16 to 18-inch crash. If you would also like a ride, then go a little cheaper on that one. Ride cymbals can be very expensive, so it is often difficult deciding one. As you practice and get better, then you can spend some time and money on a high-quality ride, and you can make sure to get the exact one that you want. You can always add a little color at any time by adding a China or a splash. They are usually a lot less expensive than the other cymbals, so they are not as expensive an addition to your drum set. Cymbal packs are also a good way to save a few bucks, as they tend to be discounted. They will include a set of hi-hats, a crash cymbal or two, a ride cymbal, and possibly a bonus specialty cymbal. Meinl Cymbals SC18MC-B Soundcaster Custom 18"
The Sabian 18″ Medium Crash is one of the bigger sized crash cymbals you will probably have in your kit, and it gives you a really big sound. The Sabian’s deep sound is pretty dark, and it sounds awesome when you play it alongside other cymbals creates harmony and melody all at once. It is also an incredibly durable cymbal due to its solid construction, so durable that a lot of music schools use it. Any musical style can use the Sabian, but it really soars when used for rock. This is considered one of Sabian’s bright cymbals, but you may find it is on the low end of the bright scale. It also has a traditional finish, and it is considered a medium weight cymbal. The Sabian 18” Medium Crash is not from one of the higher-end series, but it is a high-quality cymbal that will stand out among your cymbal collection. One of the best features of the Sabian is how affordable it is, especially with the amount of work you can get out of it. You will definitely use this cymbal a lot, and it is great for recording sessions. The Sabian Medium Crash is available at an affordable $219. Some of the best cymbals are in the Paiste Signature line where they definitely put a lot of care into their product. The Signature cymbals were made with the help of professional drummers who were charged with designing superb-sounding cymbals. This ride cymbal is inspired by Tool’s Danny Carey who designed a cymbal that makes a pingy sound that works well in rock and metal. It has a unique sound that makes it one of the more popular ride cymbals available. The very dry sound of the Paiste Signature cymbal helps it to convey ride cymbal patterns and prevent any washy sounds. It is a heavy feeling cymbal, so it is great for heavy hitters. It will also help you to develop your technique, and it won’t help you hide any inconsistencies. 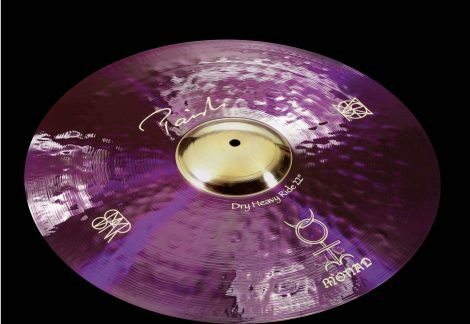 The distinctive metallic-purple finish is another one of the interesting looking cymbals that Paiste is known for. The Paiste Signature cymbal runs in the $500 range. Zildjian is one of the more popular cymbal brands in the world, and they definitely make some great sounding cymbals. They have a traditional “A” line cymbal that is made from different metal combinations that can make them sound brighter than the “A custom” cymbal line. The “A” line cymbals are a little darker than the brilliant finish of the “A custom” line. They are both great sounding cymbals, but their sound is quite different. You can use the “A” Zildjian Medium Crash for any music style since it isn’t really bright or dark. It is just a great crash cymbal that produces a sound that works with any style of music. It’s is great for gigs and for recording sessions. It has great weight, and it is not as splashy as a Thin Crash. 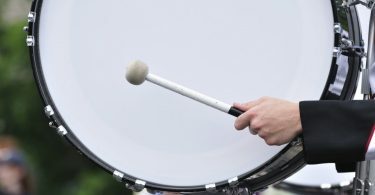 The 18” crash is a great size, and it sounds the best out of all the sizes, plus it has more depth. The “A” Zildjian has a medium pitch that often sounds high when it is recorded, and it has a long sustain that gives it a huge sound. 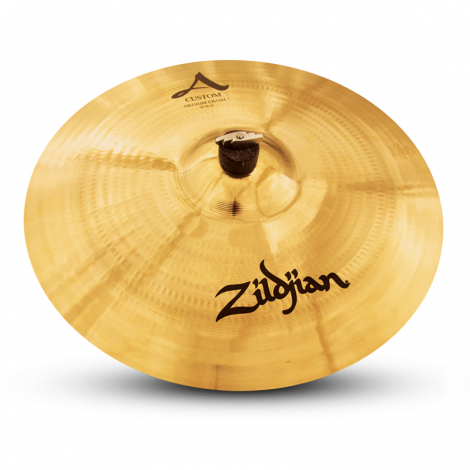 The traditional finish of the cymbal will make it blend in well with your other cymbals, and it is a very durable cymbal as one would expect from Zildjian. It is available in several sizes, but each of the sizes has a slightly different sound so it totally depends on your preferences. The “A” Zildjian is available at the affordable price of $269. The Meinl Cymbals SC18MC-B Soundcaster Custom 18″ Medium Crash Cymbal is from the Meinl Cymbal company that has been a popular European cymbal for a long time. More recently, Meinl cymbals have started to appear in the United States, particularly with metal drummers since they are extremely durable. 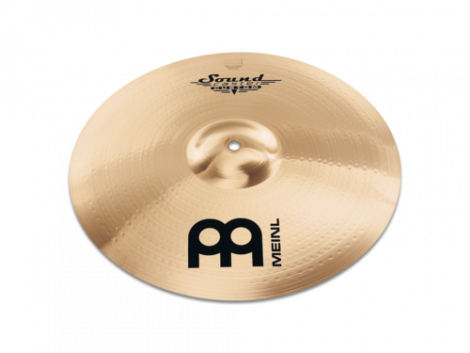 Meinl makes several cymbal lines for all musical styles like the 18″ Soundcaster Custom Medium Crash. It is a medium cymbal that stands out among the rest because of its high pitch, and its ability to cut through the texture. The Meinl Soundcaster has an average sustain and a polished finish that will look great with the rest of your kit. 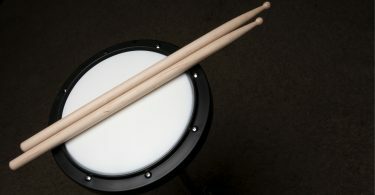 Although popular with metal drummers, it’s medium weight and warmth makes it a great choice for any type of musical style. It is also available in several sizes, and it is available at the great price of $259. 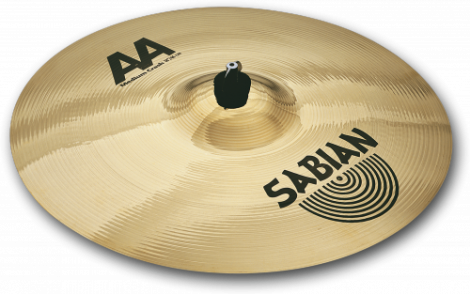 Sabian has also created a great set of hi-hat cymbals that stand out above the rest. 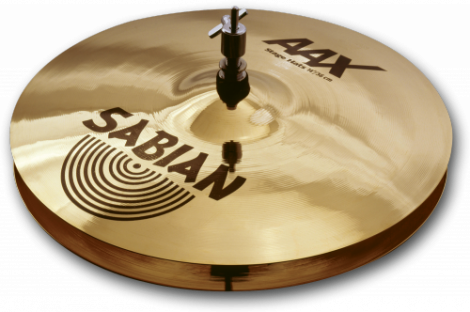 The Sabian AAX 14 Stage Hats are great for any type of music, and they sound awesome if you are playing heavy metal or light jazz. They are bright enough that they will cut through any band, but they will still blend in with their warmth. Sabian offers a medium weight top cymbal and heavy bottom cymbal that are both given a brilliant finish that makes them bright to the ear and pleasing to the eye. The AAX 14 Stage Hats are some of the best sounding hi-hats you will find. They are very durable, and they can definitely take a beating without cracking. They are also pretty affordable falling into the $339 range. 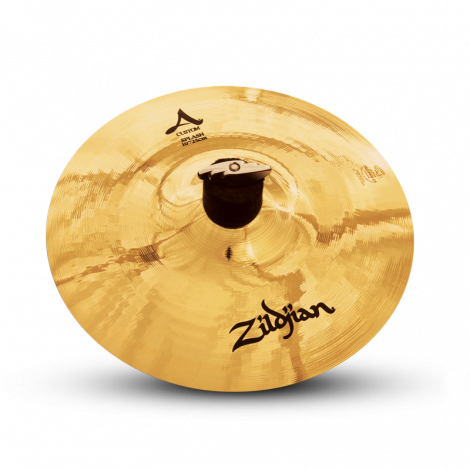 The Zildjian’s continues its popularity with the New Beat Hi-Hats that are probably some of the most well-liked hi-hats available. They have a great sound that can be used with any musical style. The Hi-Hats are part of the “A Zildjian series” that is different that the brighter sounding “A Custom” series. The “A Zildjian series” are heavier in weight, and they usually come with a lower pitch. Since they aren’t as bright as the “A Custom” series, they will actually mix in better with your other cymbals. These are great rock cymbals, but they can also be used for lighter musical styles. They are even edgy enough for metal. Since they have a traditional finish, they will also sound a little drier. These hi-hats fall into the low $300 range. 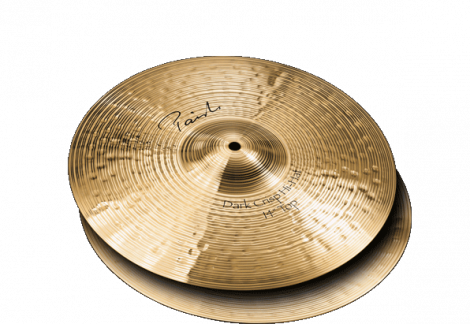 The Paiste Signature Dark Crisp hi-hat is a very crisp and dark sounding set of cymbals. They are available in two sizes, either 13 or 14 inches. The 13 inch are good for quieter jazz performances. The top cymbal is a medium weight and the bottom cymbal is heavy, but they still are able to make a tight click sound. Stick tip sound very articulate on the top cymbal, plus you can get a very responsive crisp sound. The Paiste hi-hats have a great polished professional sound to them, but they can still get down and dirty with some jazz. They are durable, so they are great for playing every day, but they aren’t good for the heavy hitters. They work well in the recording studio and sound awesome on those recordings. These are part of the top of the line Paiste cymbals, so they are on the expensive side. It is definitely worth the investment at $230 for some well-made and great sounding hi-hats. The Meinl cymbal company is a favorite among metal players, and some metal drummers exclusively use Meinl cymbals because of their loud sound and durability. 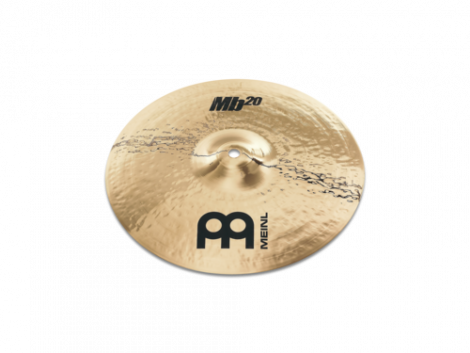 The Meinl’s MB20 Heavy Soundwave 14-inch pair has an aggressive sound that works really well for metal bands. With a long sustain and very high pitch, they are easily able to cut through the loud metal music. They are also full of energy with a very bright sound that is also helpful in cutting through metal or heavy rock. The Meinl MB20 Heavy Soundwave Hi-Hats have a brilliant finish that not only looks great on stage, but adds to their brightness. They are very heavy cymbals, and very durable. They can definitely take a beating without breaking. Their professional sound is great when it’s played either loose or open. 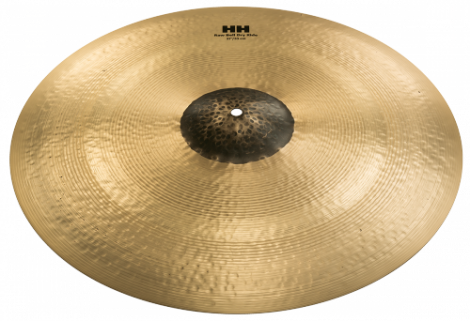 These are definitely great metal hi-hats, and they are available in the $440 range. The Sabian 21 HH Raw Bell Dry Ride is a unique sounding cymbal that makes a dry and raw sound that still keeps a lot of warmth and tone. This is a heavy cymbal that has a dark tone that is very like a vintage cymbal. It is hand-hammered, and it has a lot of character that you won’t find in other cymbals. The unlathed bell cuts give it additional articulation, plus it gives the cymbal a unique look. The Sabian has a smaller and shorter bell than other ride cymbals that is also subtle in giving the cymbal a distinct sound, clarity, and excessive ping. This is a great sounding cymbal that can be used with any musical style, and it is one of the best cymbals you will find in the stores. It is definitely worth its price of $410. 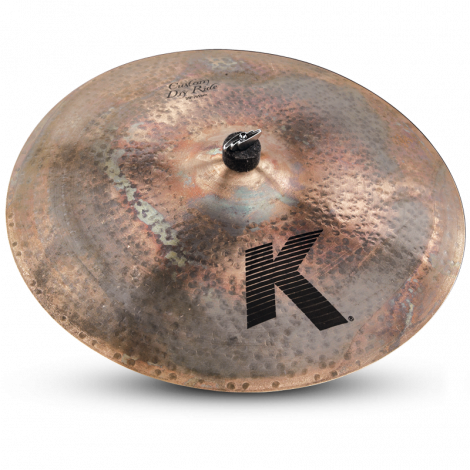 A great jazz cymbal is the Zildjian 20″ K Custom Dry Ride that belongs in the Zildjian K Custom series and is used by lots of professionals. It gives you great articulation with its very dry sound, and it makes you hit a little harder to get out the sound. The cymbal can be used for rock music, but it really excels with jazz music. It will also help you develop a more consistent ride cymbal pattern. The Zildjian Custom Dry Ride is dark and thick sounding, and it plays heavier than its real weight. It also has a very old looking appearance since it is not shiny with its natural and unlathed finish. Its low pitch can be heard at both high and low volumes. 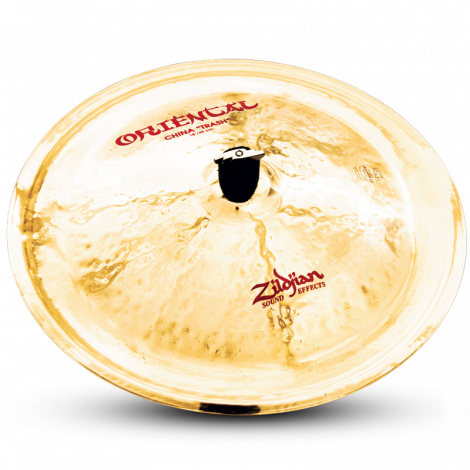 It is one of the best Zildjian cymbals, and it is available for a very affordable $365. 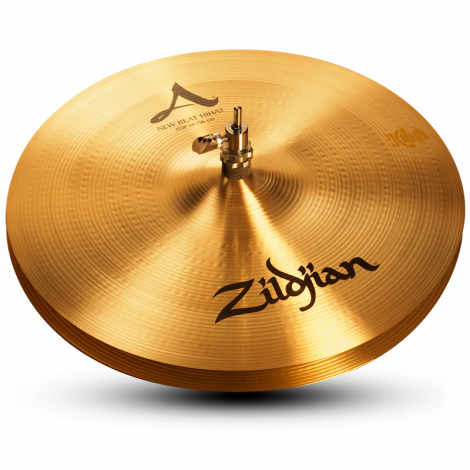 The Zildjian A Splash has a fast attack that is bright and splashy. It is the perfect splash sound for your kit with its high pitch that will stand out above the music and gives you helpful accents. It has a long sustain and a nice ring to it, plus it’s traditional finish gives it a professional look and removes some of the severity of the sound. The 10-inch is the perfect size for the best sounding splash when a drummer only has the room and time for one splash cymbal. This is a very durable cymbal that can take a beating in spite of its paper-like appearance. This high-quality cymbal is available for an affordable $120. The Zildjian 18 FX Oriental China Trash is a popular choice among drumming professionals, and it is one of the prevailing China cymbals for the rock industry. Even though Zildjian calls this a trash cymbal, it has a wonderful mix of tone and trash. The huge sound of the 18-inch size cymbal will produce a great tone that has enough trash to stand out over the awesome overtones of any band. It’s high pitch lets it cut through any music’s texture. With a brilliant finish, this cymbal will give additional ping to your playing, and it will look awesome with your kit. China cymbals are often designed to look trashy, but the Zildjian 18 FX will add a classy appearance to your drum set with its refined look. It is one of the best sounding cymbals you will find, and it is definitely worth its $260 price tag.